Walk A Mile In Her Shoes... The event is simple – MEN walk from Kentville Town Square, around the block – in women’s shoes, raising eyebrows and funds in support of The Royal LePage Shelter Foundation for Chrysalis House, helping abused women and children in the process. This event will bring together big hearts and big feet for a great cause. The event is over for this our 1st. year and it was a great success with over $6,000. raised for Chrysalis House. THANK YOU to everyone who so generously donated and sponsored me in my efforts to reach my personal fund raising goal for this worthy cause. If you have photos or video you would like us to post, please email them to us. The Irving BIG STOP Restaurant, Pamela Flawn, Michelle Ryan, Danny R Neima, Ronald Misner, Wendi Curran, Margie & Dave Bielby, The Gibsons, Daphne Cragg, Mylene Levesque, Celeste M Sanford, Jeremy & Kelly Cooper, Ron & Sharon Baxter, Mac Routliffe, Doug & Kathleen Schofield, Julianna VanMeekeren, Brenda Bishop, Bill Watts, Eric & Joanne Mitchell, Nadine Kimbal, Kim & Judy Thompson, Shawna Peverill, Andrew Jamieson, Amanda Fredericks. Pastor Sterling Gosman, Helen Eagles, Marina Cooper, Amy Christou, Ernest Robinson, Heather Lohr, Andrew Newton, Ted & Ethel Nicholson, Jamie & Lisa Williams, Jeff Keizer, Jan Savage. 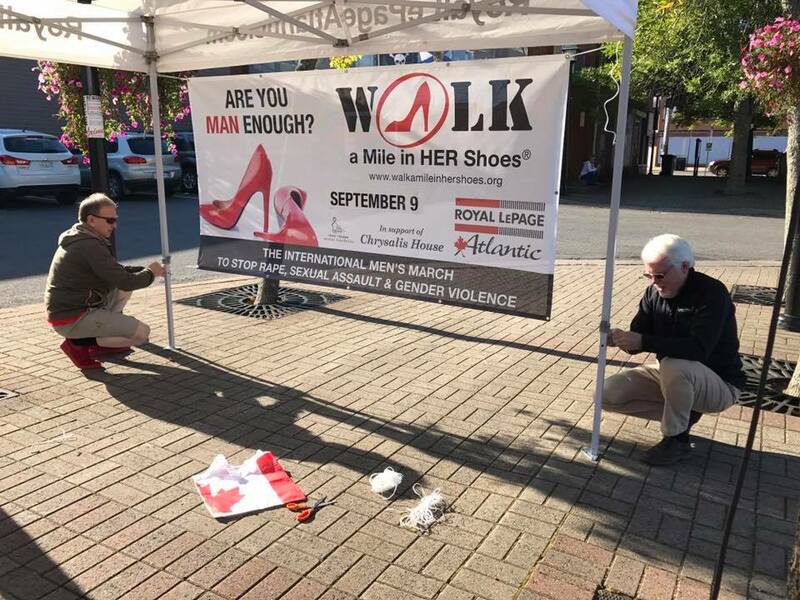 Licensed by Frank Baird and Walk a Mile in Her Shoes®, a Venture Humanity, Inc. Project in support of Chrysalis House, Kentville. Here is a short video to help explain what "Walk a Mile in Her Shoes®" is about. 1. SPONSOR: Wayne Sanford online, then click on "Sponsor Me" to make a donation to my effort to meet my fundraising goal, OR support me by downloading a pledge sheet to raise donations in your office, business or group. 2. Join me in the WALK: Sign-up as an individual or recruit a team to join you to "Walk a Mile in Her Shoes®". Complete the registration form below. (A registration fee of $25. per walker applies.) Once registered you will receive pledge form and a link where you can set up your own personal/team page and begin collecting pledges online by asking colleagues, friends, family, suppliers, customers – anyone who will give money to see you walk around in a pair of women’s shoes for a great cause... and we provide the shoes! Make you minimum goal of pledges to $100. per walker and hopefully much more. Come to Kentville Town Square on Sept. 9 to show your support. Walk begins at 11am. Spread the word on social media and "Share" my posts of this event. Start a conversation with the people you know and let them know what you stand for. Challenge others to make a pledge or to become a walker. 100% of funds raised will flow through the Royal LePage Shelter Foundation to Chrysalis House in Kentville. A tax receipt will be sent by February 2018 for donations of $20 or more.